My cold has gotten a lot better, almost gone actually. But it was a nasty one. So I didn’t want to take any chances. What better way to oust it from my system than nourishing my body with a delicious hearty traditional Korean soup? As such, my husband and I went on a quest to find samgyetang (soup with whole young chicken stuffed with glutinous rice, ginseng, and jujubes) in Koreatown (NYC). 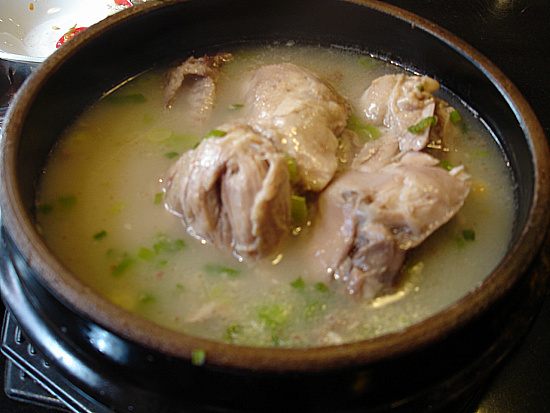 The first restaurant we found that served samgyetang was Shilla. But last time we were there, we saw a small mouse scurrying up the stairs while we were in the middle of dinner. I guess I should find some comfort in the fact that it wasn’t a large rat. Needless to say, we passed on Shilla. After hitting two more restaurants without much success, we found a restaurant that served samgyetang, Seoul Garden. Seoul Garden is a modest looking place, located on the second floor of a building on 32nd Street. We passed by it many times, but never considered going in. I’m glad we did this time. I, of course, ordered the samgyetang. And my husband ordered the wooguhji-galbi-tang (galbi and Korean cabbage soup). 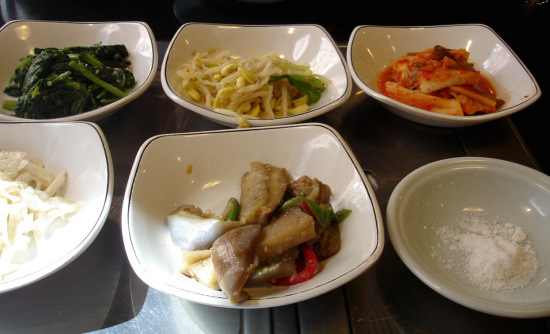 Banchan came out first as it normally does in Korean restaurants. The spread was a bit sparse and uneventful – only five side dishes in total including kimchi. 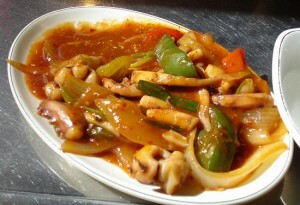 But they served us a complementary plate of ohjinguh bokkeum (sautéed squid and vegetables in spicy sauce). 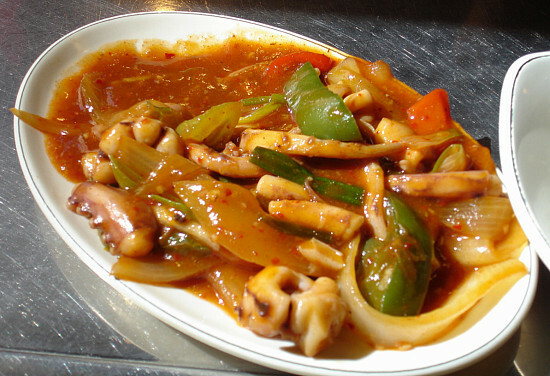 Squid was a bit overcooked and rubbery, but the vegetables were good. And the sauce was appropriately sweet, spicy, and salty. I must say though, the kimchi, was excellent. It tasted homemade. It wasn’t caked in gochugaru(korean chili pepper) as in many restaurants. It was refreshing, flavored well, and fermented just right. When the samgyetang came out, I was surprised by the portion size. It looked huge. But a lot of it was broth. I wasn’t complaining; the hot broth was what I was craving anyway. And the broth was really rich. It was also deceptively flavorful. When I first started eating, the soup seemed a bit bland. But the more I ate, the better it tasted. A small saucer of salt was served with the soup, either as a dip for the chicken meat or as a flavoring agent for the soup. I didn’t need much of the salt. The soup was rich and flavorful enough without too much additional salt. My husband’s wooguhji-galbi-tang was pretty good as well. My husband loved the soup. Generally speaking, Korean men (including my dad, grandfather, my husband, and the Korean men I have worked with) love this type of soup – especially after a late night out. Personally, the broth was a little too “beefy,” but the doenjang-based broth was flavored well – neither too salty nor bland. All in all, it was a really pleasant experience. The food satisfied my cravings. The service was efficient. I must preface that by saying I don’t expect too much in terms of service when dining at a Korean restaurant. I’ve been to restaurants where the servers clear the tables while diners are still eating (Yes Wonjo, I’m talking to you! ); now, that’s a little more than I can take. But I tend to tolerate worse service in Korean restaurants than I otherwise would. I chalk it up to differences in culture. Call me a masochist; but I consider the mildly abrasive service a part of an authentic Korean restaurant experience. But I didn’t have to worry about that at Seoul Garden. Our main server was extremely friendly. When I told her how much I loved the kimchi, she packed me a small bowlful of the fermented goodness to take home. That’s good service! Needless to say, my husband and I will be back soon – particularly my husband. He can’t wait to go back for their barbecue dishes! Hangawi - Korean Vegan Oasis in Manhattan?